Very strong concentrate of Sandworm oils, pheromones and amino acids made from the real bait. Perfect to marinate or apply directly onto bait or absorbent lures. BioEdge Potions are highly concentrated solutions of oils, pheromone, enzymes, amino acids and natural feeding stimulants. Each is available in a 2oz squirt bottle. 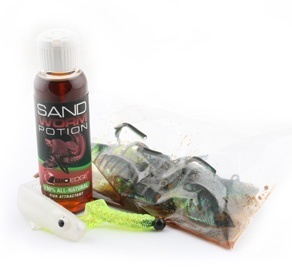 Potions can be applied to live or cut baits, flies and soft plastic lures. Marinate soft plastics with a sqirt of BioEdge Potion and they will absorb and slowly release powerful bait extracts for hours. A pipe cleaner soaked in the Potion and inserted into a tube lure has proven deadly on target fish.